Dontnod’s Life is Strange is my current favorite example of a game as literature--and as one can probably tell from the tattoo that now covers my forearm, I have invested a considerable amount of thought into this. Too much thought, in fact, to fit it all into a single blog post or essay. That said, I figured I have to start somewhere! First, in this post, I’m going to go through rundown of LiS’s most prominent theme and how it gets delivered through both narrative elements and game mechanics. If I can find the time, I’ll get around to other things about the game--its complicated relationship with the presentation of mental health issues, a discussion of the endings, situations it handles well or poorly, etc--in other posts. So, why do I have this tattoo on my arm? Read on to find out! A picture of a forearm tattoo, with the text "This action will have consequences" and images including a lighthouse, a tornado, a torn Polaroid, and a spiral symbol. Inspired by Life is Strange, and rendered by Tiff George at Sayan Studios in Alexandria, VA. Note: Spoilers abound, and I’m not going to be simply reiterating the plot here, so please: go play the game before reading further! Or, at least, watch the amazingly complete playthroughs and theorycraft videos of Geek Remix, which I watched to help refresh myself on the game while writing this! While it is far from perfect, Life is Strange is a well-wrought experience. The atmosphere and (for some) nostalgia value in the setting, the relatability of the characters, the superbly-selected musical scoring, and innumerable other elements common to cinematic media play a part here, of course, but it’s more than that. It doesn’t just contain elements of “literary merit” that could be ported to books, plays, or cinema. Unlike many games, it also takes advantage of its interactive nature to support its themes, and that tuning of mechanics to message is one of the reasons Life is Strange can be unpacked as deeply as any literary novel. A screencap showing the warning from the beginning of Life is Strange, quoted below. While many games feature choice and consequence as a mechanic--those by Telltale, creators of The Walking Dead and other adventure games, come to mind--Life is Strange takes this element further by baking it into the story as the primary theme, making this little splash-screen into an abstract of the game’s purpose. Dontnod pushes the idea that a central part of growing up, of being an adult, is learning to accept that your actions have consequences beyond your control. Being able to live with those consequences and move forward may be wrenching, but it makes functioning in a difficult universe possible. As the warning fades and gameplay begins, the player is presented with a brief demonstration of that theme in action. The protagonist is caught in a storm, seeking safety at a lighthouse in the face of an oncoming tornado (a waterspout, technically). The symbolism of a lighthouse as shelter from a storm is fairly clear-cut, but things get interesting when the player guides their character to the lighthouse, only to have the storm fling a boat into it, causing it to topple onto her. This rather abrupt disaster foreshadows both the game’s final scene at the lighthouse, and also its primary theme. Sure, humans try to impose order on chaos and make the world a safer place, but do our endeavors have the intended results? The lighthouse was built as a beacon of civilization meant to safeguard against tragedy, but that doesn’t mean it can stand against all that comes (or that it won’t manage to fall on someone, killing them). This isn’t a one-off moment; the lighthouse and the tornado are recurring motifs throughout the story, and the tension between the chaos of life and the all-too-human desire to step in and prevent tragedy is the central, driving force behind most of the player’s actions. A screencap showing a selfie of Max, with the text "Look at this crap! How can I show this to Mr. Jefferson?" Next, the player gets a chance to preview more of the motifs to make appearances throughout the later stages of the story. The game cuts from the lighthouse to a classroom where Max “Never Maxine” Caulfield (a Catcher in the Rye reference) finally gets the chance to introduce herself to us through her situation, her journal, and her inner monologue. She is shy and full of self-doubt, unable to take positive action in almost any form; she just observes and records the world around her through her photographs and journal. She doesn’t have the guts to stand up for Kate when someone throws a nasty note at her, turn in her entry for the Everyday Heroes photo contest, or interfere when she sees Daniel being bullied by Logan and his friends. Of course, other things are going on here, too--foreshadowing of many kinds, from the graffiti and missing-person posters, to Jefferson’s featured art and the fact that Max calls his camera a “monster” and points out how he took a class photo of her even though she “didn’t want to be in it at all,” for example--but the idea that Max feels paralyzed, a bystander in her own life, comes through loud and clear. In fact, when she first gets back to her own dorm room, she refers to it as a “cocoon” and, upon looking in the mirror, declares that it’s “Hard to believe [she’s] 18,” before asking herself, “Do I look any older? Just more stressed.” At the start of her journey, she doesn’t feel like an adult, or like she has control. 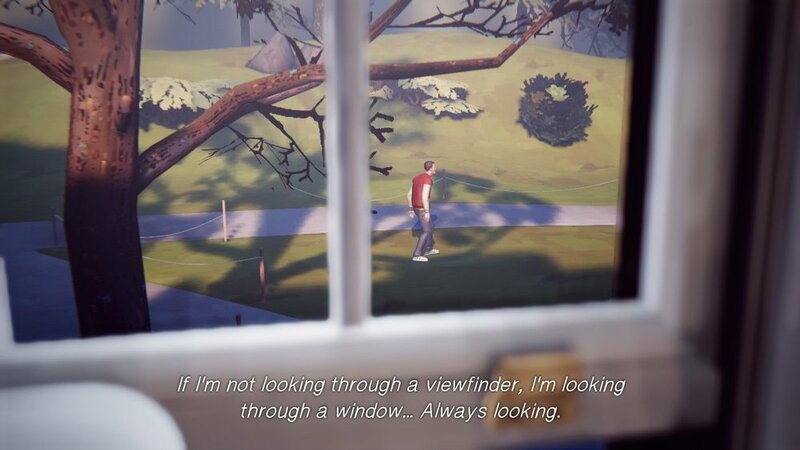 A screencap of Max's view through a window, with the text: "If I'm not looking through a viewfinder, I'm looking through a window... Always looking." As the story picks up, Max serves as a way for the player to ask the question that was almost the game’s title: “What if?” When Max realizes she can rewind time, she essentially gains the superpowered version of social anxiety. At first, she uses her power primarily to undo her own mistakes and, depending on player choice, to make people like her more by altering what she says to suit their preferences. The “tutorial” moments kick this trend off by letting her fix her broken camera (which is then, soon after, broken for good, a fact which also foreshadows things to come), answer a question correctly in class, and quote John Lennon to Jefferson before he has the chance to do so himself. This shows the player what they need to know mechanically, while at the same time also showcasing Max’s insecurities, weaving the gameplay into the critical narrative elements. A screencap of Max and Chloe talking, with the text: "I don't feel grown up. Just more confused as I get older. Especially after today..."
In keeping with her anxiety, when Max applies her powers for a more noble purpose by saving Chloe in the bathroom, she also gives herself a burst of confidence… in her powers, rather than herself. Throughout the rest of this episode, when Max is confronted by critical choices (to report Nathan or hide the truth; to comfort or mock Victoria; to take a picture or intervene when David is harassing Kate; whether or not to take the blame for Chloe’s pot), she engages in metaphorical hand-wringing, questioning her own decisions as soon as she’s made them. Did she just make more trouble for herself down the line? Should she go back and try the other path? Again, mechanical cue serves a thematic purpose: it encourages the player to remember that they can rewind things and see both versions of events, but it also shows them how hesitant Max continues to be, even now that she possesses an amazing power. She hasn’t really learned anything yet. A screencap of Max, with the text: "I felt like an everyday hero helping Kate but now Officer David Dickhead is after me." The major decision-points are worthy of their own, more thorough analysis, but one of the most impressive things about LiS is the attention to detail in the less obviously important moments. Just as it is entirely possible to guess at much of the game’s conclusion from looking at the symbolism and foreshadowing in the first few scenes, there are little things throughout the game that form patterns which serve the overall themes of the story. For instance, a fellow student, Alyssa, is frequently “endangered” by her environment in ways Max can rewind time to prevent. Saving Alyssa from harm does earn her favor at first, but can eventually lead to her death when she notices Max’s uncanny way of appearing during moments of disaster. Similarly, watering the plant Lisa keeps her alive… until it doesn’t, and the overwatering kills her. Being friendly to Victoria, likewise, can lead to her death, simply because she trusts Max to genuinely want to help her. And even if the player miss all of these moments, the game hammers the idea home when Max attempts to alter the world by saving William, creating an alternate timeline containing some of the game’s most controversial, though still thematically on-point, consequences. A screencap of Dana reprimanding Max, with the text: "You're not helpful, you're just nosey. I think you better go..."
And while these are all examples of well-intended actions having unexpectedly negative results--something that most games avoid, since they prefer to maintain a consistent “right action is rewarded” trend--the game also subverts player expectations in other ways. In Episode One, the decision to pick up and look at Dana’s pregnancy test becomes one of the first largely-one-sided options in the game. Because Dana’s reaction is immediate and severely negative, 98% of players (as of this writing) wind up in situations that the game records as “Did not touch Dana’s pregnancy test,” which means they either missed it, or found it, but then used their Rewind powers to go back and stop Dana from being mad at them for being nosy (Note: Credit goes to Geek Remix's "Unpopular Decisions" charity stream for this discovery!). While this use of Max’s rewind power may seem natural at first--no one wants to upset their friends--this is one of the most emotionally manipulative things Max can do, as she can then get Dana to talk about her unintended pregnancy and subsequent abortion or miscarriage (it isn’t made clear which) by pretending to have heard a rumor about her. This bit of temporal snooping doesn’t lead to any obviously negative results, but it does make Max out to be so anxious to please that she is willing to violate the privacy of her friends and manipulate them with her powers. On the other hand, if the player resists the urge to rewind, and instead simply lets Dana be angry and kick Max out of her room, the game provides an unexpected twist: The next day, Max can appeal to Dana for forgiveness and have it granted, as an apparently-negative result transforms into a honest relationship that includes candid discussion of personal flaws! And, critically, this character growth doesn’t happen if the player constantly takes back all their “mistakes,” which serves as a very early example of the same point that is made at the end of the game: People don’t move on in life by wishing away their missteps and flaws. They have to learn to accept the fact that their actions have consequences and, even if they seem unfair, living with them and moving on is the right thing to do. 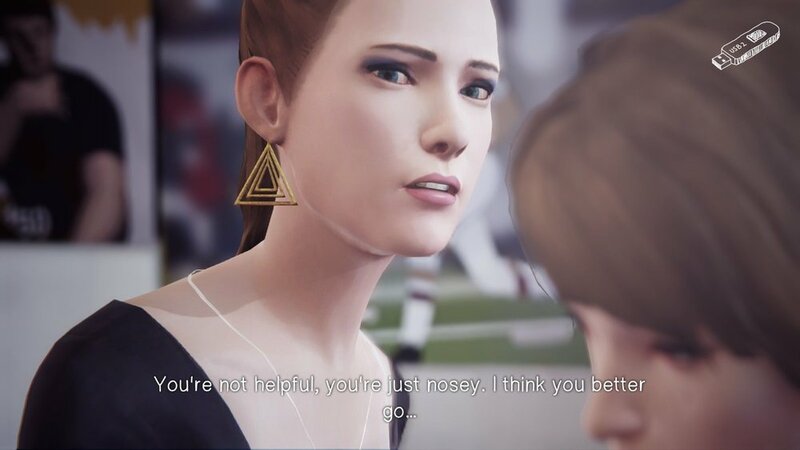 A screencap of Chloe talking to Max, with the text: "Stop second-guessing yourself, Max!" The incident with Dana is difficult to see without more than one playthrough, but this primary theme is communicated in increasingly obvious ways from Episode Three onward. At that point, Chloe, ever the avatar of consequences, literally tells Max to stop second-guessing herself; by now, Max does question fewer of her own decisions, but still often lacks confidence. She finds herself prodded to take firmer stands, and yet is still faced with the problems caused by Chloe’s troubled past… something Max is aware that she helped create by not staying in touch. As a result, when Max discovers her ability to travel through time with a photo, it feels natural for her to prevent the death of Chloe’s father, William. Such a major turning point is the sort of thing the game would normally ask the player to accept or decline, but it doesn’t do that this time. Here, LiS replaces the usual either/or choice with a new mini-game that only has one possible outcome. A screencap of young Max looking at William and Chloe, with the text: "I love William like he was in my own family... I won't let him die today. I won't." Why? Max made this decision for herself. Having experimented with her newfound power initially out of pure curiosity, Max then consciously makes the decision to save William’s life without player input. As a result, she experiences the literally life-altering consequences of her actions... ones she ultimately decides--again, without player input--she is unwilling to live with. She returns to the world as she knew it, having learned that trying to fix everything doesn’t always work out the way she expects. While this plays out linearly for the player, it is to Max the same thing as being presented with two options (“Save William or Let William Die”), picking one, and then rewinding and ultimately choosing the second option. But the player didn’t make the choices. Max did! Just like when dealing with Dana and the pregnancy test, choosing to NOT use her time powers has immediate, positive results. While Max initially time-jumped from her dorm, feeling upset after a confrontation with Chloe, she returns the next day and finds herself in Chloe’s room. The two have made considerable progress on their investigation, as well as having made up from their argument the previous day, again demonstrating that accepting the consequences of her actions leads to stronger relationships and better outcomes. 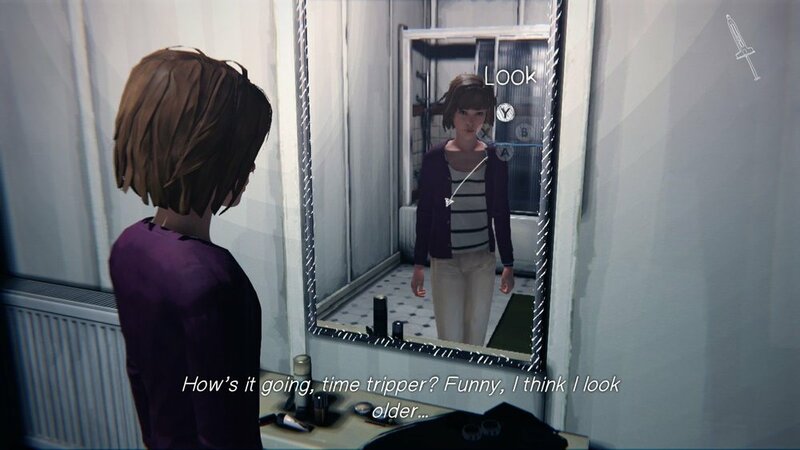 A screencap of Max looking into a mirror, with the text: "How's it going, time tripper? Funny, I think I look older..."
And in the immediate aftermath, Max has an entirely new perspective on her powers. From this point on, when confronted with important decisions, Max is either happy with either result of her decision, or actively prefers one that falls more in line with her growing personality. Rather than second-guessing herself and questioning her decisions, she can now look at what she did and accept that it was either right or wrong. Stopping Warren from beating up Nathan or not; navigating a conversation so that Chloe kills, wounds, or befriends Frank; and warning or not warning Victoria about Nathan; most choices become clear-cut in Max’s mind, even as the consequences remain as unpredictable as ever. Other characters comment that Max suddenly seems like a “force of nature,” “fearless,” and “invincible” these days. Even Max notices the difference in herself when she looks in a mirror, paralleling the mirror-moment in Episode One, and imagines that she somehow looks older now. This also lets the player continue to have some input into the game while subtly removing their control over Max’s personality as she gains confidence. A screencap of Max speaking to Kate, with the text: "Always remember that you're not alone. I've got your back, no matter what happens." This confidence blossoms throughout Episode Five. Max at first appears helpless in Jefferson’s “darkroom,” but nonetheless takes control of the situation. Her powers help, of course, but it’s not just the supernatural. Travelling back to the classroom scene where we first witnessed her incredible insecurities, Max comforts Kate much more directly, faces down Victoria and encourages her to be a better person, and not only engages in verbal sparring with Jefferson, but finally turns in the photo she criticized and destroyed in the first episode. She uses a combination of her abilities and her cunning to distract Jefferson and let David take him down. She even wins the Everyday Heroes contest, but is unhesitating about sacrificing that victory for a chance to stop the tornado, since she is no longer relying on how others see her for her sense of self-worth. And as the game reaches its finale, the motif of accepting-the-consequences-of-actions makes ever more frequent appearances. In Episode Four, Chloe, if allowed to kill Frank, decides she will have to turn herself in for the crime after she solves the mystery of Rachel’s disappearance. In Episode Five, Nathan apologizes to Max via voicemail, in the face of his own impending death, revealing that his recent anger and insecurity stemmed from his inability to accept the consequences of his earlier actions. Even Max has to accept that Victoria will believe her warning about Nathan, or not, based solely on their prior relationship. In the end, Chloe makes a final speech about accepting fate, and offers Max the game’s ultimate decision. 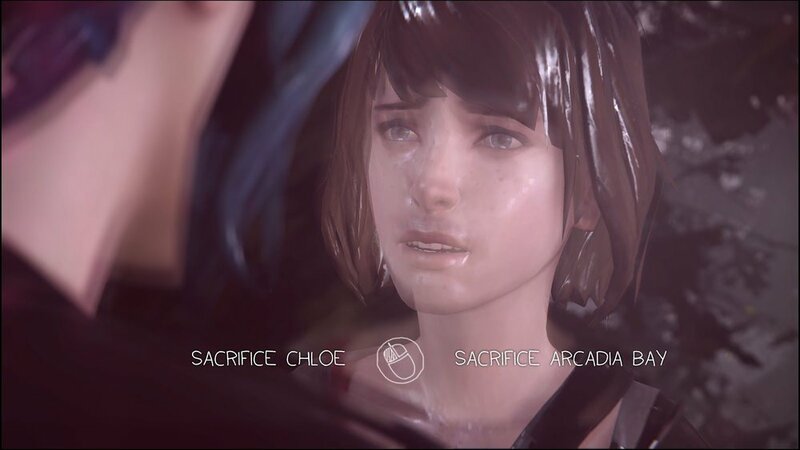 A screencap of Max and Chloe during the final choice of the game, with the text: "Sacrifice Chloe [or] Sacrifice Arcadia Bay." While the choice to sacrifice either Chloe or Arcadia Bay has been commented on extensively across the internet, one of the most important things about this decision is that it continues to merge mechanics with narrative. No matter which option the player chooses, the outcome is thematically the same: Max learns to accept the consequences of her actions. This parity means that, unlike most choice-based games which offer thematically opposed options in order to grant the player a feeling of control, all of LiS’s structure remains relevant in either ending. If Max sacrifices Chloe, she accepts her part in letting Chloe die. She cut off contact with a vulnerable friend going through one of the toughest things that could happen in a child’s life, and as a result, Chloe grew up without the support she needed. She accepts that trying to use her powers to change fate--which parallels the very much real-world desire of many people to change their past actions--isn’t the way forward, and chooses not to have used them at all. On the other hand, if Max sacrifices Arcadia Bay, she accepts that her attempts to change things for the better have spiraled--hah!--out of her control, and caused destruction that she could never have predicted. She stops trying to alter fate, and takes on the burden of consequences earned thus far, even the ones that are unfair to her. Either way, she lives with the hurt she has caused, says goodbye to the things that are gone, and continues with her life. While there is plenty to criticize about Life is Strange, it is this consistency and richness of thematic content that games need to start seeing as a baseline, rather than an outlying possibility. Games as a storytelling medium have opportunities that other formats simply don’t, and LiS only scratches the surface of what may be to come in the next decade. Perhaps, in the near future, developers will be more willing to devote the resources necessary to make games with deeply written content that do offer thematically-divergent endings that were both (or all) supported by the writing throughout the game. Hopefully, they will continue to tackle sensitive issues, but with the increasing maturity and realism that come from experience. And in the end, it seems increasingly likely, games will receive their much-deserved mainstream recognition as a literary genre. A screencap of Max looking out her window in the morning, showing Warren creepily peering around a corner and looking up into her room. *Other than the choice to ignore, hug, or kiss Warren, which… is that really a choice, especially after the Window Creeper Warren moment from Episode 2?